A study by researchers at Hull University has concluded that just thinking about your muscles can make them stronger. Gyms up and down the country are contemplating bankruptcy. The sedentary life of an Assembly Member suddenly seems far healthier. 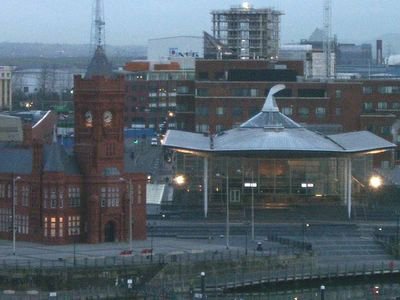 A member of the public has put a freedom of information request to the Assembly Parliamentary Service to ask how is the Welsh Assembly financed? "Who provides the money for the overheads. e.g. operating and administrative costs such as members salaries and expenses, staff salaries, capital expenditure etc? Where is this funding raised from?" The simple answer is that the taxpayer pays, which no doubt will include the person making the enquiry. The same goes for Parliament and local Councils. The price of a democratic society is not small. The price we would pay for a dictatorship would be even greater. I would have hoped that the enquirer would understand that. In times of crisis a government relies on its junior Ministers and backbenches to offer it support in the chamber. Often this can take the form of helpful interventions on opposition members, pointing out inconsistencies in their argument. At other times it will be speeches or questions. Occasionally, however this helpfulness can overstep the line and come across as just plain sycophancy. Huw Lewis: I congratulate you, in passing, on the way that you have stood up to opposition attempts to sabotage your promotion of social justice in the arts and arts spending. I particularly welcome the interim appointment of Dai Smith as chair of the Arts Council of Wales. Will the Minister outline the role that he sees for the arts and culture in the development of the Heads of the Valleys strategy, which must have at its core not just purely economic outcomes, but a permanent improvement in the quality of life in our communities? Alun Pugh: That is a fair point. Communities along the Heads of the Valleys are certainly in need of substantial public investment. I am very clear on that. On the appointment of Dai Smith as the interim and temporary chair of the Arts Council of Wales, I can think of very few people in Wales who could bring the combination of his distinguished academic record and his accomplished management expertise to bear. Up until this moment nobody had even considered that the bungling way Alun Pugh has handled the appointment of the interim chair of the Arts Council might have anything to do with social justice. Most people had just put it down to the fact that he was out of his depth. The Policy Exchange, a right-of-centre think tank, have said that the move to create one police force for Wales is based on misguided and misleading analysis. The report, 'Size Isn't Everything: Restructuring Policing in England and Wales', says big forces are no more efficient than small ones - even on serious cross-border crime. It recommends that instead the Government should allow forces voluntarily to federate where necessary, extend the remit of national policing agencies, give more power and responsibility to Basic Command Units, and modernise policing practices and working structures. "By forcing through traumatic and counter-productive mergers in the teeth of public and much professional opinion, the Government is wasting political capital and hindering the fight against crime," said Anna Reid, who edited the report. "Amalgamation would destroy hard-won co-terminosity with the Crown Prosecution Service and the courts and probation services, making it hard for them to cooperate with the police." Most policing is managed through BCUs. Each unit typically consists of several hundred officers headed by a superintendent or chief superintendent. But the report warns that those units may not preserve the local democratic accountability of the current forces. It says senior police officers are reluctant to give BCUs powers over their own management and finance, leaving them with full control only of spending on overtime and office equipment. When combined with the cost of merger, which most people expect to fall on hard-pressed Council Tax payers, this is a pretty damning verdict on an ill-advised Labour Government initiative. The Presiding Officer makes the very reasonable point in this morning's Western Mail that the Assembly needs to be more representative of Welsh society. In particular he believes that there needs to be AMs elected next time who belong to ethnic minorities. Further reading reveals that what he is actually doing is placing himself firmly behind the candidature of Cardiff councillor Mohammed Islam, as the second list candidate for Plaid Cymru in South Wales Central. Councillor Islam faces a very tough contest against former Ceredigion MP, Simon Thomas and his ward colleague, Gwenllian Lansdown. He will need all the support he can muster. Nobody can fault Dafydd Elis-Thomas on this. He is doing this openly and he is showing his party a practical way forward towards achieving a worthwhile goal. It is a path that other parties have trodden before and it is far from a done deal, but we do need to keep trying until we get a diverse Assembly that reflects the community we represent. The Western Mail reports that the Youth Hostel Association invited Plaid Cymru Assembly Member, Janet Ryder, to a reception, and then offered to don Dr Martens boots and "kick her up the arse". It was all a mix up of course but in today's Plenary a number of Labour members seemed to sympathise with the sentiments. In the past, we have debated dance. It would be useful if we considered engaging the youth of today, particularly in how they play and dress, and their fashion. I welcome the new fashion of Dr Marten boots, which are appropriate wear for the youth of today. I hope that you can consider my contribution today. The Wales Labour Party really are depending on Gordon Brown succeeding as Prime Minister in good time for next May's elections. Why else would they tie their political fortunes in so completely with the UK Labour Party by effectively dismantling their separate Welsh operation? The risk behind this strategy of course is if Tony Blair hangs on. Labour will then find themselves pitching for votes to the Welsh electorate on the coat-tails of a discredited and mistrusted Prime Minister whose main appeal remains to middle England. You don't always get what you wish for Rhodri. This article in the Western Mail is very charitable in respect of the in-fighting and manoeuvring going on within the Welsh Tory Party. It is really quite astonishing that candidates in an internal party selection are not allowed to attend party functions or to canvass support. Nevertheless, a senior official in the Montgomeryshire Conservative Association felt it necessary to write to all his members and ask that they support a particular candidate. Rumours are rife in the Assembly of plots and shenanigans to depose Tory Assembly Member, Glyn Davies, in favour of his fellow Mid and West Wales Tory AM, Lisa Francis. It is little wonder that Glyn's allies are seeking to fight back against perceived behind-the-scenes plotting. It is possible that the placing of this story on these terms is part of the attempt to undermine Glyn. If the result of all this is various factions within the region's Conservative Associations engaged in open warfare then that is all the better for the rest of us. I've always had a great affection for smokers - they're so faithful. Tobacco companies have lied to them for decades, spiked products to make them more addictive, manipulated research, danced around compensation suits until plaintiffs have died of smoking-related illnesses, even insulted tobacco users in confidential mailings - and still they keep on buying. Smokers apparently don't care how environmentally damaging Big Tobacco's production methods are, or how many dodgy political connections they have - smokers are very loving and forgiving people. So I always try to be kind to smokers. Sympathetic headlines bemoaned an erosion of civil liberties, and I can see their point. Perhaps people should have the right to poison bar staff and waiters: some of them are very annoying. I look forward to articles extolling my right to purchase shoes made by children: children can also be annoying. I'm tired of going to smokers' funerals. Being dead adversely affects their civil rights. How long do we have to wait now before Wales can follow Scotland and Ireland in banning smoking in the workplace? A new analysis shows for the first time the impact of an operation by three big Conservative donors to bankroll critical seats in the run-up to polling day, revealing it raised up to 10 times as much in donations as Labour in some places - producing large swings to oust sitting MPs. And while most recipients declared the gifts in the Commons register of members' interests once elected, David Cameron - whose Witney constituency in Oxfordshire got £5,500 from his party's former treasurer, Lord Ashcroft, among others - did not. The report by Peter Bradley, a former Labour MP who lost to one of the bankrolled candidates last May, shows how money poured in during the two years before the election - much of it before strict spending curbs imposed during the actual campaign took effect. There is nothing illegal about any of this of course. Nor is it actually against the law to receive loans from overseas donors, which are then siphoned into target seats. In fact I believe that it will prove very difficult to impose spending limits in constituencies outside of an election period when MPs all enjoy substantial largesse from the taxpayer to circulate annual reports, not available to their opponents. It is bad enough seeking to identify and categorise expenditure during an election. The number of grey areas around peacetime spending would be insurmountable in my view. What is needed in this situation is transparency. We need to be clear whether overseas lenders should be outlawed in line with overseas donors. We need to ensure that loans are subject to the same rules as donations and we must look at state funding so as to take away any suspicion that influence or position is being bought. The Government can no longer avoid answering hard questions on this issue. Rhodri Morgan will set out Labour's stall for the next Assembly elections during his party's Welsh Conference in Swansea today - 'vote for us because we are not the Tories'. Has anybody told Tony Blair that? As First Minister, Rhodri Morgan has always been very circumspect in the way that he has reshuffled Ministers. He prefers the surgical incision rather than the wholesale night of the long knives. Thus when he carried out his last change he jettisoned only one Minister, brought in Brian Gibbons at Health and moved the much-criticised Jane Hutt sideways. Some thought he should have been more radical but Rhodri is nothing, if not loyal to his friends. David Melding: NHS Wales now has a deficit of over £70 million, and the figure is rising. Dr Gibbons is quite a popular fellow here, and I do not necessarily want him turfed out immediately. However, do you not think that he ought to be put on a period of probation so that you can monitor his performance and perhaps show us some improvement? Sue Essex: I have no power to turf out Brian Gibbons, nor would I want to, and he is not ailing, sick or showing any signs of stress. I do not think that your statement that there is a deficit of over £70 million is factually correct. The in-year deficit this year is estimated to be £20 million, according to Brian’s February statement. We need to make clear that we are talking about a deficit of £20 million this year, so that people do not think that the £71 million that is being bandied around is this year’s deficit. David Melding: The Minister left us with an incredible vision that, down in the saloon bar of the ‘Dog and Order in Council’, they talk of nothing but the Government of Wales Bill and how the Labour Party has found the centre of gravity on devolution. I find it incredible that Labour has the gall to come here and say that, on the one hand, the popularity of this Government is such that devolution is soaring in the polls, while, on the other hand, the Government does not have the guts to put the real question to the people of Wales, which, incidentally, should have been put in 1997: should this be a proper Parliament to balance the fact that we already have—at least in legal terms—a proper Government? It does not know what to do with its powers, but that is a different matter. I find it incredible that the way that this Bill has been examined in the Assembly has led to no intellectual curiosity whatsoever on the Labour benches; they accept completely what is proposed by their colleagues in Westminster. I do not know if Stalin ever wrote poetry—it would, no doubt, have been exceptionally bad poetry had he done so. Given his personality, he would probably have passed his first draft to a minion and said, ‘Please criticise it freely’, and the minion would have come back with some epic paean of praise saying that it should not be altered in any way, not one jot or comma. That is the approach that we seem to have had from the Government. It looked at a Bill of over 140 clauses, and did it propose an amendment? Not a sausage; not a cocktail sausage came from the Minister. She has completely swallowed everything. I am grateful for the mixed metaphor that has come from my right—‘hook, line and sinker’. Let us return to the Order in Council, because it is very much like the first day of a slick New Labour budget. It seemed such a clever idea to those who support it; indeed, it confused others for a little while. After a few days, it all started to unravel under the light of scrutiny. What is an Order in Council? It either leaves a veto in another legislature, or with another Government Minister—not in this Government—or it, in effect, creates primary powers. It gives you an elegant system that saves the notional sovereignty of Parliament, in that everything has to go through Westminster, but it is the equivalent of the Royal Assent. If that is the way that you expect Orders in Council to operate—that powers will be given on request in any area for which the Government has devolved responsibility in Wales—you should have the guts to say that that is primary powers. You should go to the people of Wales and ask whether they approve or not. That is why we tabled amendment 13. It would do away with Part 3 of the Bill, which creates this peculiar mechanism—unique, as far as I can work out, in the English-speaking world—and put in Part 4, which would create a Scottish-style Parliament or a Northern-Ireland-style Assembly that could pass laws and hold its Government properly to account in that process. That would have been the way to take forward the constitutional settlement and the way to better balance the British constitution. However, it would have had one consequence, namely that the number of MPs from Wales—and I now address Gwenda Thomas’s points—like the number of MPs from Scotland, would have been reduced to a figure based on the population. This talk of not having our say on macro-economic and defence policy is nonsense. We would have as much of a say as the people of England and we would have as many representatives as England per head of population. So, let us not let this Labour Party off the hook. It is Labour that wants this system; it wants mock primary powers. We have everything other than an Act of Parliament, but that is their function. Yet, we still have a system that over-represents the Labour Party in Westminster because you know that the next general election will be a tighter contest than the last election and you may have to generate your majority in other parts of the United Kingdom. That is your motivation. It is little wonder that Labour refused to support an extension of the time available for the debate. Listening to Radio Wales this morning I heard an interview with the very charming and down to earth, Betty Morgan. Betty is 63 years old and has just won a silver medal for Wales in the Commonwealth Games in bowls. 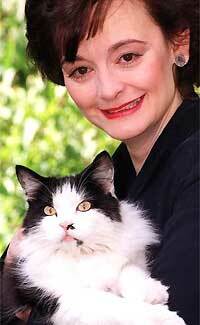 She hails from Llandrindod Wells and sounds wonderfully harmless. It was a bit of a shock therefore when she ended the interview by saying that she had to go for a doping test. I am sure that she tested negative but who knew that bowls had become so cut-throat? The big subject of debate today continues to be yesterday's voting on the Government of Wales Bill motion. Despite there being 29 Labour members and 29 from the opposition, the Government managed to lose three key votes and were forced to vote down their own motion because it had been amended. The reaction of their Assembly Members to this was a series of points of order in which they blamed the electronic voting system for their own inability to press the right button at the right time. I have heard all sorts of conspiracy theories including the preposterous suggestion that a vote was recorded on behalf of the absent Peter Law. An e-mail was circulated from the Presiding Office this morning to tell us that extensive testing had concluded that there was nothing wrong with the system. This seems to be borne out by the fact that of those Labour members who were complaining that their vote had not been counted, none of them are recorded as "not voting", with the possible exception of Ann Jones on amendment 10. It is also apparent from the record of voting here that in some cases opposition members failed to vote properly as well. What is most interesting is that the failure of Cabinet members to vote properly seems to have been a deciding factor in all three lost votes. All in all the conspiracy theories appear to be unfounded. However, if the Government are going to survive future votes they may want to put the luddites in their camp onto a crash course in how to use the Siambr computer equipment. SA1, A new part of Swansea's growing waterfront which will feature 2,000 new homes, a second marina housing hundreds of yachts, bars, brasseries, restaurants, offices and artwork. Come and see for yourself, you will not regret it. Another of Plaid's great assets - Dafydd Elis-Thomas - is essentially marginalised, partly because of his role as the Assembly's Presiding Officer. But his exclusion goes beyond that: he currently has little influence over the direction Plaid is taking, and is regarded almost with contempt by leading figures in the party. Instead of taking advantage of the statesmanlike skills of Elis-Thomas, a significant proportion of the party would rather he wasn't there. Many have never forgiven him for taking a peerage following his departure from the Commons in 1992, preferring to blank out from their minds the House of Lords' continuing crucial legislative role. The Western Mail though needs to move on. Firstly, they promote Dafydd Wigley, now they are pushing forward another of Plaid's past Presidents for the top job. Do they not think that perhaps we should let the voters decide? No, this is not another Plenary report though we could have a discussion about which AM would play the soup dragon and the iron chicken if you wish. The BBC have published a poll of the top 20 children's programmes and top of the pile is Rainbow. The Magic Roundabout is at number two whilst Mr. Benn shares third spot with Playschool. All-in-all a remarkably conservative ranking. It is a great disappointment that Bagpuss, The Wombles and the Clangers are trailing in fifth and sixth places respectively. And why the low placing awarded to Roobarb and Custard and Captain Pugwash? The most significant factor in this list is that the programmes are practically all from previous decades. That may reflect the nostalgic preferences of the 25-45 year age group who were surveyed, but surely these people have children and share their viewing with them. Clearly, they don't make kid's shows like they used to. Mick Bates: As we know, vision without action is a daydream and, yes, there are daydreamers on the Government frontbench. Dream on, for example, if you think that the delivery of health in Wales is improving or that the incidence of child poverty has been reduced. Mind you, action without vision is a nightmare and there are those on the Government frontbenches who have suffered nightmares. Who would have thought that such a simple issue as school breakfasts would turn out to be a nightmare? Eleanor Burnham: The Welsh Liberal Democrats, as you heard from our main speaker, sincerely believe that promoting energy efficiency is vital as part of achieving a sustainable Wales, and it helps to not only reduce carbon dioxide emissions—today’s buzzwords—but secure a viable energy and global future, which, given all the natural disasters around the world, is crucial. I think back to my own childhood, which was unbelievable in sustainable development terms. I was brought up on a farm in Cynwyd, where my father would milk the cows with a tractor and we had lamps. Yes, I am that old, unfortunately. We did not have that much rubbish, and whatever rubbish we had, we disposed of ourselves. We also had our own water from a well, which was delicious. Thinking seriously about the issue, we were completely self-sustainable, and that is what we should aim for. There is no doubt, if you want green policies then the Liberal Democrats are the party for you. I think everybody thought it was a bit peculiar when the Treasurer of the Labour Party went on television and openly attacked his own leader and Prime Minister over the way that he was raising money for the party. After all, the days of washing their laundry in public were meant to have disappeared with the discipline imposed by Mandelson, Campbell and Blair when they knocked Labour into shape so as to make it fit for power. Charles Clarke says he has "serious questions about Jack Dromey's capacity" as Labour treasurer after the row over the £14m of secret loans to the party. He says the fact Mr Dromey did not know about the loans meant "you have to wonder how well he was doing his work". Let us hope that Mr. Dromey retaliates with comments about Mr. Clarke's mishandling of I.D. cards, anti-terrorism legislation and student top-up fees. It is not as if there is any shortage of stones to throw in the Westminster green house. As a spectator sport it has the potential to outrank George Galloway on Big Brother. Update: And so it goes on. The BBC are reporting that the Chair of the Labour National Executive has accused the Home Secretary of speaking out of turn. Does anybody else wish to join in? An interesting stand-off is developing in the Welsh Assembly that will come to a head on Wednesday. On that day we are due to debate the report of the Committee set up to scrutinise the Government of Wales Bill. That committee was politically balanced, containing five Labour members and five members of the opposition. It was chaired by the Presiding Officer who made an early decision to abstain from voting. As a result all of the opposition's amendments were defeated on the casting vote of the chair in accordance with Assembly procedures. When the report comes to Plenary tomorrow all of those amendments will be up for discussion again. What is more the opposition will be at full strength and so will be able to vote them through. The big question though is who is going to chair the Plenary session? I am told that as he chaired the Committee the Presiding Officer intends to move the report. Accordingly, he will not be in the big seat. The Deputy Presiding Officer has tabled his own amendments and I understand also intends to speak in support of them. The Opposition leaders have determined that none of their members will stand in for the duo and I cannot see the Labour Party providing an alternative chair either. It is perfectly possible of course that an amicable resolution to this dilemma will have been found by the time that the debate is due to start. If that proves impossible then the session may well have to be suspended indefinitely until a chair is found. With the protagonists in their present mood that could be some time away. Update: I am told that the Presiding Officer will now be chairing the debate and that he may move the report from the chair. So what has happened to the Welsh Culture Minister? Has he gone off to sulk after losing a vote in the Assembly on how the top six Welsh Arts organisations should be funded? Has he decided that the best response to this vote is glorious inactivity? Today's news that the Assembly Government has failed to advertise for a new Chair of the Arts Council of Wales - even though Geraint Talfan Davies leaves the post at the end of next week - is very disturbing. I believe that the Government actually wanted to abolish the Arts Council as part of their bonfire of the Quangos but found that they were unable to do so because of the royal charter and the problems of distributing lottery money without an independent body. Having met this obstacle they then tried to emasculate the organisation by effectively removing its Chair and introducing direct funding for bodies hitherto dependent on the Arts Council for their survival. Now that they have been foiled in this endeavour Labour seem intent on allowing the Arts Council to drift rudderless in the hope that it will run aground. Thus, the failure to advertise for a successor to Geraint Talfan Davies. Of course it could just be incompetence on the part of the Government, but conspiracy theories are so much more fun, aren't they? DAVID LLOYD GEORGE, the Welsh Prime Minister who won the general election nearly 100 years ago, is still shaping major events in world politics from beyond the grave, it is claimed. The 1906 General Election was of course, won by the Liberal, Henry Campbell-Bannerman. David Lloyd George did not become Prime Minister until 1916 and did not win an election to that post until 1918. That is nearly 88 years ago. The paper also reports that the Prime Minister has also been informed of Humphrey's demise. Are we to expect a tearful tribute in the House? Surely, even Tony could not be that popularist and opportunistic. An analysis by the accountants Ernst & Young, based on the Treasury’s own figures, shows the chancellor will match the record high for the tax burden this year and rise above it next year. That means it will be higher than in the 1970s under Denis Healey, when the top rate of income tax was 83%, and the early 1980s, when it was 60%. Brown will unveil his 10th budget on Wednesday, which Treasury sources say will be an exercise in “consolidation”. The Ernst & Young analysis shows that the tax burden excluding North Sea oil revenues, the best measure of the load faced by families and businesses, will be 37.6% of gross domestic product this year, close to the 37.7% peak reached in the early 1980s. As always with these things it is what you do with the money that is important in maintaining public support for certain tax levels. However, with expenditure by the Government on the Iraq War at £3 billion and rising, then it is going to be more and more difficult to justify these tax levels to the electorate without a clear idea as to how much longer we must maintain our commitment to a military presence there. The cost of this war certainly puts the NHS debt (about £700m in England and Wales) and the income from student fees (about £1 billion from top-up fees) into perspective. The three or four days we spend in the Assembly each week are always very intense, involving back-to-back meetings and catching up on the correspondence. As a result we often miss some of the more trivial stories and gossip doing the rounds. there have been 16 thefts reported on the premises of the National Assembly in the past two years amounting to £14,974 worth of cash and valuables. These include two £10 notes taken from the female toilets; a raincoat snatched from Cathays Park worth £100; a personal pedometer worth £5; seven laptops, two flat-screen monitors, two PCs, two mobile phones and a briefcase. Goodness only knows what might have gone missing if we did not have our own Police Station on the premises. The Alyn and Deeside Assembly Member, Carl Sargeant being caught out contradicting himself. He told one reporter that a vote for Plaid was as good as voting Tory. "If the people of Wales want a Tory in charge of our schools and hospitals then they should vote for Wigley and Plaid," he said in response to the news that the former Plaid Cymru leader is staging a comeback. However, only last month he told the Daily Post: "Bring back Dafydd Wigley. He was the only one who realised that winning the support of people from outside their narrowly-focussed origins was the only way they would make any headway." Make your mind up, Carl. The Llanelli Labour AM, Catherine Thomas, reportedly threw an intern out of her office last week, because the aspiring politician was a Plaid Cymru supporter. Just because you are paranoid does not mean they are not out to get you, Catherine. I have not really got the time to watch reality TV, so it is unlikely that I will catch the Liberal Democrat Shadow Chief Secretary to the Treasury on 'The Games'. However, I will try and follow Julia Goldsworthy's performance from afar. This morning's Guardian questions whether she should be taking part at all. It seems that George Galloway's humilating performance on Big Brother has further undermined the credibility of these shows for 'serious politicians'. However, as Julia Goldsworthy points out this is hardly the same thing. She has no delusions about using the show for wider political purposes nor will she be incommunicado from her constituents and Parliament as Galloway was. What she will be doing is raising money for Cornwall's Air Ambulance service whilst at the same time demonstrating how down-to-earth and normal she really is. On that basis I say good luck to her. Will it be a two-horse race though? Bar charts at the ready, we need to know. With a level of vitriol not seen since Betjaman coined his famous diatribe against Slough, Wales' National Poet unleashes her pen on the Welsh Rugby Union. A year after Gwyneth Lewis celebrated the Grand Slam in rhyme, she has hit out at the game's hierarchy for losing the Welsh team both their coach Mike Ruddock and their form. the time is ripe for your overthrow. of play but thought, maybe, of cash. but look, in your hands, it slips into smoke. You've made our last Grand Slam a joke. your backroom moves of dodge and scheme. It's you who need to raise your game. shadowy men with hands like sieves. it's you, not the team, who have dropped the ball. Hang this up, with shame, in your hall. It is not exactly Shakespeare but then they had not invented rugby in his day, thank goodness. The South Wales Evening Post reports that eight Assembly cabinet members, who each earn around £80,000 a year, spent taxpayers' money to send their festive greetings rather than dig into their own pockets. Gower AM Edwina Hart was the only one to pay for the cards out of her own pocket. So when I got my Christmas cards off various Ministers last year I had in fact contributed to their cost through my taxes. Swell! Kirsty Williams: If we could get women into senior positions during their working lives, issues around pensions would, perhaps, not be so critical. Some 75 per cent of Welsh women work in cleaning, catering or clerical services, and women are massively under-represented at senior levels-70 per cent of all NHS staff are women, but only 20 per cent of hospital consultants are female. There are no female police authority chairs, no female university vice-chancellors, and, dare I say it, no female party leaders. How will your campaign address this? I am now taking odds on who will be the first female leader of a Welsh political party. With over a 1,000 visitors a day and a plethora of groups wanting to come and see it, the Senedd building is more popular than ever. It has now got to the point whereby staff cannot fit in any tours much before July and even then there are few spots available. On the other hand talk is that staff working in the building are suffering. Apparently, walking on slate floors all day is not good for the joints. This is a serious issue. Maybe we should consider carpets after all. Having done a few interviews recently speculating on likely coalitions after the 2007 Assembly elections I was pleased to see a throw-away comment by Lembit Öpik this morning that might well assist in dealing with this enquiries. Commenting on the second reading vote on the Education Bill, in which Tony Blair got his legislation passed only with the help of the Tories, Lembit said he was "disappointed but not surprised by the result. People ask the Liberal Democrats theoretical questions about coalitions but now we have a practical example of a coalition between Labour and the Conservatives. The two are converging philosophically on so many issues and we're heading back to an old-fashioned Conservative education policy." Perhaps the next Assembly elections will throw up a Labour-Tory coalition running Wales with Rhodri Morgan as First Minister and Nick Bourne as his deputy. Now that would be entertaining. One of the joys of First Minister’s question time is the sheer variety of topics covered as members try to pin him down on something, anything of substance. Yesterday was no exception. Lisa Francis: I was concerned by the findings of a BBC Wales survey, which showed that half of the councils in Wales intend to end weekly refuse collections. Recycling is obviously important, but collecting rubbish once every fortnight could pose serious hygiene problems, especially in coastal towns with a preponderance of seagulls, no wheelie-bin provision and many fast-food outlets. What discussions have you had with county councils about the serious hygiene risks posed by leftover commercial waste in our seaside towns? The Assembly Government has never been accused of seeking to increase the number of seagulls before so this was a first. In some areas it is often horses who scavenge off bin bags, clearly seaside towns have a worse problem. Kirsty Williams: In your reply to John Griffiths, you recognised the ongoing importance of European funding for parts of south Newport and south Cardiff. Given that average earnings in Powys are £50 per week lower than the Welsh average, do you understand the importance of ongoing European funding for Powys as well? I take it that, in your negotiations with London, you will be lobbying for all of east Wales and will not just try to defend the seats of Labour politicians. The First Minister: That is a bit over the top, Kirsty. I think that you should have another think about that when you read it in the Record tomorrow. I was answering John Griffiths, and I was referring to the fact that we now have a hard negotiation ahead of us with the Treasury in terms of how much of east Wales follow-on funding we can get. It will not be at all comparable with the £1.3 billion that has come to Wales as a whole for Objective 1, which I am sure you celebrate like everyone else, but it is restricted to two thirds of Wales in geographical area and population coverage. I have emphasised to the Assembly until I am almost blue—not politically, but in the face—how important this negotiation is in getting the additional money for east Wales. It will be for as wide an area as we can get, and it will be for as much as we can get, and we will be in competition with Scotland and England for it. I raised the issue of Labour’s pledge to get all school buildings fit for purpose by 2010 and was astonished to find the First Minister blaming local Councils for the fact that they will fail to meet this target. After all they made the promise in the full knowledge that it will be up to local government to deliver on it. The First Minister was also being a little misleading in failing to point out that lack of government funding is a key factor and that the school improvement grant has been cut by more than third next year. I think that Elin Jones made the point that that £450 million could have gone on health or anything else, but obviously the issue is that if you had another £450 million from somewhere else, you have got another £450 million, but what does that tell you? That is like saying, if my aunty was a bloke, she would be my uncle. Equally, if his aunt was a one-legged duck, then she would be going round in circles. Rather like this government in fact. "They are books which might not be of much interest to the general population but I find very interesting and very cheap." I am not sure where he finds the time to read them, but if anybody wants a copy of Labour's 2003 Assembly Manifesto they now know where to go. Dr Balsom said, "As far as the North Wales regional result in 2003 was concerned, Plaid Cymru were awarded the fourth seat out of four on the PR calculations, so were nowhere near being allocated another seat. The Tories may take Clwyd West, but this won't have any real effect on the Plaid vote. Labour may capture back Wrexham, or John Marek might stand on the list alone. If he were to stand on the list, I suspect he might get elected. If he fights the seat he might well lose. Neither of these scenarios does much for Plaid, as I suspect John has always taken some Plaid supporters for his anti-Labour stance. Plaid's best chance of winning two list seats is if Ieuan loses Ynys Mon, but Dafydd can hardly campaign on this basis! "More generally there is little evidence that the Plaid position today, or even in 2007, will be better than in 2003. Adding Dafydd to the campaign team may have a key part to play in raising the Plaid vote across the whole of Wales, but ironically this will have least impact in North Wales, for the Plaid vote is already well established and thus has less capacity for growth. Plaid are awarding Wigley the status of Messiah and seem confident that his very presence will be enough to get the extra 10,000 North Wales list votes that they need. As this is rapidly becoming an discussion for anoraks then maybe it is best left there, however if Wigley could not do it for them in 1999 then there is no reason to suppose he will do any better in 2007. Just to put things into perspective. Even at their height in 1999, when Dafydd Wigley was party leader and representing a North Wales seat, Plaid still only managed to win one top-up regional seat in the North. In 2003 they effectively came fourth and sixth in the region. They would need to leapfrog the Tories to do better and get that second seat. Of course nothing is impossible, especially if the Conservatives win some constituency seats. However, all the indications are that short of Plaid doing well enough to win an overall majority in the Assembly, a result that would be completely contrary to current political trends, they need to rely on the Tories doing very well indeed to get Dafydd Wigley back into a Cardiff Bay seat. If the Welsh Liberal Democrats also improve their performance as polls and the General Election result indicate that they will, then Mr. Wigley will miss out on a seat altogether. Update: Is somebody setting Dafydd Wigley up to fail? I thought that it was worth highlighting in full a comment to this post on the decision of the Tories to jettison their duly selected candidate for Carmarthen West and South Pembrokeshire, John Jenkins. Mr. Jenkins had once described gays as having a "medical mental condition" on his website, but despite this his party allowed him to proceed all the way to selection before realising their mistake and acting to try and avoid a public relations disaster. "Peter, very interesting observation regarding my resignation as the Conservative candidate for Carmarthen West and South Pembrokeshire. You are indeed right, I was pre-approved by the Board of the Welsh Conservative Party to be able to apply for constituency nominations for the 2007 Welsh Assembly elections. I was also selected with over 80% of the vote at a meeting of members of the local Conservative Association to be their candidate. All these people knew of my reputation - which I will repeat again for your benefit - was a hatchet job by the Western Mail/BBC Wales back in 2003 whereby they seriously distorted my comments to make me (and the Conservative Party) look like some foaming at the mouth right wing nut job. I was pre-approved by the Welsh Conservative Party and selected legitimately by a local Conservative Association but when Colonial-Governor Cameron saw the potential for trouble and the possible tarnishing of his oh-so-perfect image he panicked and demanded my head on a plate, which I gave him voluntarily along with the two ripped halves of my Conservative Party membership card. If my own side won't even support me when I have done nothing wrong then they are not a Party worth associating with. To be honest I expect you and the Lib Dems, Labour and Plaid to have a dig, you are only doing your job as part of the (dare I say it) Punch & Judy politics sideshow. So your comments are a little inaccurate but that is excusable being a member of another political party and now knowing the full story but, yes, you are right, the Conservative Party knew all about my baggage - The Chairman, President, Director and Leader of the Welsh Conservative Party are all members of the Board of the Welsh Conservative Party and could have vetoed by pre-approval if they wanted to but they knew I was not a raving mad homophobe so pre-approved me. If there is only one thing that this incident proves is not that the Conservative Party is made up of homophobic loonies but that the strings of the Welsh Conservative Party are being firmly pulled from London and surely that is of far more consequence and importance in the run-up to the next Welsh Assembly elections than the inconsequential fate of an ex-Tory councillor from Llanelli?" We all know that political parties try to manage their publicity, but in this case the Tories clearly did not see the crisis coming until it was right on top of them. What John Jenkins has demonstrated in his comment is that the new, so-called liberal Conservatism is a sham. The Conservative Party apparatus did not apparently care about Mr. Jenkin's views or the principles that they themselves are now espousing. If they did then they would have acted sooner. Instead their sole motivation was to avoid embarrassment. Their outrage was entirely manufactured because if it had been otherwise then they would have acted earlier to either not approve him or to prevent his selection. Eighty per cent of the local membership of Carmarthen West and South Pembrokeshire Conservative Association voted to endorse Mr. Jenkins in full knowledge of his views. That says a lot more about the current disposition of the modern Conservative Party than any comment or policy pronouncement that may come from the mouths of Nick Bourne or David Cameron. LIB DEM National Assembly leader Mike German yesterday urged members to send him ideas on a postcard as the party looked to find policies before next year's election. Mr German told the party's spring conference in Wrexham the party must "leave no stone unturned" in finding policies likely to go down well with voters. He said: "I challenge all of you here to go home and ask your friends and neighbours how they would improve Wales. What laws would they change to make life better? "And when you have those ideas, write them on a postcard or send me an e-mail." Other parties devise their policies on the back of an envelope, but that is not good enough for the Welsh Liberal Democrats, we use a postcard! Two conferences over two weekends and we are snowed in again. Is there no end to this weather? Meanwhile, the Sunday papers reveal that Tony Blair is being snowed under with a series of sleaze allegations that could well undermine his legacy. The Observer finds two more mortgages signed by Tessa Jowell to help finance her estranged husband's business dealings, whilst other papers detail the growing storm over the number of peerages being offered to people who have donated or lent money to New Labour. Once more I repeat my plea to radically reform the way that political parties are funded and to introduce state funding. In policy terms, would the UK Government have stumped up the cash for the Wales Millennium Centre? Would the Blair agenda have driven down waiting lists more quickly? Would the M4 toll road already be built, the environmental questions that originally delayed it less of concern in Whitehall than in Cardiff? It's unlikely there would have been a bonfire of the quangos, and education standards have risen since the Assembly took over. Above all, we have a greater degree of accountability. Leaking roof or not, you can stroll down to the Senedd and realistically get hold of your AM or even a Minister. The sense of ownership over the Assembly is quite strong all over Wales. That is one reason why I believe that if the referendum were held again then the majority would be even greater in favour of retaining it. It is also a compelling reason why Labour's caution in the measures contained in the Government of Wales Bill is so out of step with the needs and desires of Wales. Last night's rally at the Welsh Liberal Democrats Conference in Wrexham was a huge success and has set the tone for the rest of the weekend. The appearance of Liberal Democrat leader Menzies Campbell made all the difference, though some inspirational speeches from Wrexham Council leader, Aled Roberts, former Wrexham MP, Tom Ellis and Lord Roger Roberts also helped. We will gloss over the comment from Baronness Walmsley that the beginning of the year had been a real 'bummer' for the party, so as to spare any more blushes. To be fair though her performance was superb. This morning's Western Mail reports Ming as saying that any decisions on coalition in Wales is a matter for the Welsh Party. This has always been the case and was how it happened in 2000, but it is worth restating the position for a media who have never really got their head around the idea of a political party allowing its constituent parts to make decisions for themselves. Such latitude would never be allowed to the Welsh Conservatives or Labour of course. Today is the second time I have had to check the date of the newspaper I was reading to ensure that it was not 1 April. Yesterday it was the Swanseas University Student Union's 'Waterfront' magazine, which described a proposal for a 'leek island' to be constructed in Swansea Bay. Now it is the Western Mail with the same suggestion, characterised as a 'man-made Daffodil Island'. My colleagues on Swansea Council are too kind about this latest brain-child of the Vice-Chancellor of Swansea University. The Council Leader describes it as a 'visionary idea' whilst a local Councillor points out that we are not Dubai and do not have money to burn. Too right! With lecturers on strike over their pay, with Swansea University considering a multi-million pound shortfall in capital maintenance and with the entire Higher Education sector in Wales struggling with years of under-investment, the last thing we need from our Vice-Chancellor is crackpot schemes such as this. Perhaps he should get his head out of the clouds and address these issues instead of chasing headlines in this way. Wednesday's Plenary meeting saw an innovation at Minister's Question time. In the past the Party Leaders had the option of asking multiple supplementaries on a question of their choosing to the First Minister. Somehow this privilege had been extended to the subject Ministers' question time as well. As a result, backbenchers and party spokespersons did not get much of a look-in. Leanne Wood: I am sure that you would agree that Flying Start and the foundation phase are closely linked, as the foundation phase is the comparable scheme for three to seven-year-olds. You announced in November that the foundation phase will not be rolled out across Wales until two years later than was originally intended, therefore we will not see it implemented until September 2008. There are many concerns in the education sector that this scheme may never go ahead. Given your Government’s recent record on broken promises, how can you convince the people of Wales this afternoon that the Flying Start scheme and the foundation scheme are more than just election gimmicks? Health Minister, Brian Gibbons, who had recently announced that he was abandoning Labour's manifesto promise to introduce free personal care for the disabled smiled wryly at this remark and shuffled awkwardly in his seat. It was a very effective put-down of a fellow cabinet minister. ‘today, in Welsh schools, too many pupils’ minds are unseen and their owners are made economically disabled’. They become disillusioned. School inadvertently trains them in absenteeism as they devise ways to escape what they see as a raw deal. Headteachers have stated that these forgotten young people can comprise up to 50 per cent of a year group. A further 35 per cent of those aged below 17 with anti-social behaviour orders have a diagnosed mental health disorder or an accepted learning difficulty. The number being sent to pupil referral units has jumped, and a high percentage of convicted young offenders have learning difficulties. They have been let down by a system that lacks the expertise and resources to meet their very special needs. Last autumn, I spoke to a conference in Wrexham on attention deficit hyperactivity disorder, and heard from experts that children need agreed boundaries. Let that be a lesson to us all. Let us develop a whole-school approach to behaviour and discipline in Welsh schools that is child centred and evidence led. Let us start by listening more, preaching less, and moving out of the educational never-never land in which we seem to be trapped at the moment. Mark, when I think about never-never land, I always feel that that is where you are, rather than the rest of us. I say that because the chief inspector produces an annual report for the Assembly without fear or favour, where she has said that the quality of schools in Wales has continued to climb, as has the quality of teaching. The number of schools that are considered to be failing, where we have had to introduce special measures and so on, has always been small—these are facts; it is not never-never land. All we need to do now is to decide which character from J.M. Barrie's classic tale Mark best represents. Is it Peter Pan himself, Captain Hook or should it be Mr. Smee? 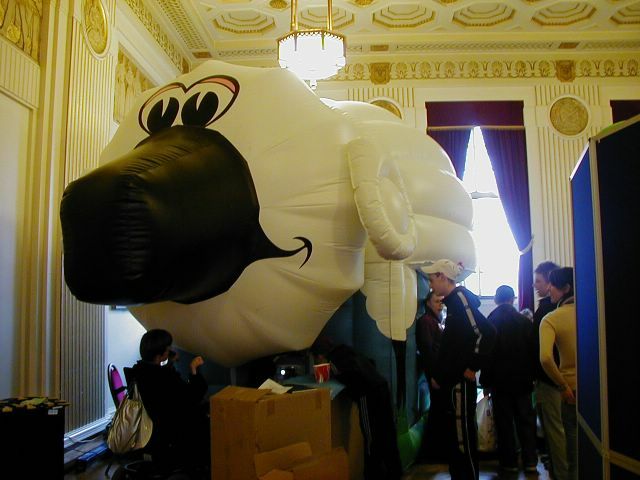 This giant inflatable sheep was photographed at a youth forum event in Swansea Guildhall. We do not believe in perpetuating stereotypes. Oh no! Rather bizarrely the Assembly's internet system is currently restricting access to The Times on-line site and the equivalent domain for The Sun. Have we fallen out with Rupert Murdoch? I think we should be told. As I believe I have commented before the availablity of the internet in the Assembly Chamber is a mixed blessing. One of the reasons for this is that people in the public gallery can read everything that is up on the computer screen. Yesterday afternoon I discovered this for myself. I had popped out of the chamber during one of the short debates to show some constituents around the Senedd. I started off by taking them into the public gallery and took up residence on the front row of seats there. Looking down I could quite clearly see that one member had on-line Sudoku up on their screen. Obviously, the speeches were less riveting than usual. Normally it is political leaks. Last week on St. David's Day, it was just leeks. Today we learn that the Senedd building is leaking. Yes, water is coming in at a number of points. Luckily, we have not taken full possession off the builders. They will have to fix this before we do. Still, at least a beam has not come loose in the chamber yet. So how disillusioned are Plaid Cymru with their Social Justice spokesperson, Leanne Wood? More to the point, if political parties did not have to reselect their politicians every four years, would the news media have anything to report? The source told the Western Mail yesterday, "Next year, assuming the Government of Wales Bill gets through Parliament, the National Assembly will have a new route available to create laws for Wales. The next stage will be to acquire full lawmaking powers in devolved areas. Then, if we can take the people of Wales with us, in due course we will be looking to take responsibility for defence and foreign affairs. Only at that point would the question arise whether there should be a Welsh republic. But Leanne is campaigning on that now, as if a Welsh republic were immediately attainable. I doubt if Ieuan Wyn Jones will be putting it quite in those terms on the hustings in twelve months time, or the Presiding Officer for that matter! Some interesting speculation in this morning's Western Mail as to who will be appointed as the Liberal Democrats Spokesperson on Welsh Affairs. Rumours are that Cardiff Central MP, Jenny Willott, will replace her old boss Lembit Öpik in this role, despite the fact that Lembit remains the elected Leader of the Welsh Liberal Democrats. Jenny supported Ming in the leadership contest whilst Lembit declared his support for Mark Oaten and then quietly moved on to back Simon Hughes once Oaten had dropped out. It is perhaps telling that Sir Menzies Campbell was the only one of the three party leadership candidates not to accept a lift in Lembit's plane. He has said that he intends to be bold, but not that bold. I understand that Sir Menzies Campbell has said that he will be coming to Welsh Conference in Wrexham this weekend after all. That is confirmed in the Western Mail. Much as I would like to claim some credit for this change of heart and even though I know that Ming's acting head of office reads this blog, I really do not think that it was down to me. Still it is refreshing to know that we have a leader who is prepared to keep his promises. Although David Cameron came to Wales at the weekend and told critics of his policy reforms that he was prepared to accelerate the pace of change even further, things are not so hunky-dory in the Conservative Party. The right-winger, dubbed The Vulcan by bitter ex-wife Gail, produced a pamphlet backing controversial flat taxes. It would mean everyone from binmen to billionaires pays the same rate. His call comes weeks after Mr Cameron ruled out the scheme and will be seen as a direct challenge to the leader's authority as he seeks to move the party to the centre. Redwood was recently put in charge of developing Tory economic policy. In rejecting Mr Cameron's olive branch, he is opening up the prospect of a rift in the party. Mr Cameron has pledged that the Tories now believe in putting stability above tax cuts. But in his pamphlet The Bad Bet - Economic Failure of the European Union, Redwood calls for massive tax cuts and flat rates of about 20 per cent for individuals and firms. Treasury sources said cutting taxes to a flat rate of 20 per cent would cost the economy nearly £50billion - the entire education budget. Cameron is discovering to his cost that herding dinosaurs in thunder is not an easy task at all. The Assembly's Equal Opportunities Committee has taken up the cudgels over Lowri Turner's outrageously homophobic article in which she wrote that gay men do not make good party leaders as their lifestyles are "too divorced from the norm". It seems that they want the Western Mail editor to justify his decision to publish the column. Committe Chair, Gwenda Thomas, is quoted as saying that "the freedom of the press to publish personal views carried a "responsibility" which had been "clearly overstepped". She added: "Homophobia, together with all other forms of prejudice, is unacceptable in any modern, democratic, civilised society, and it is therefore disappointing to say the least that an article that promotes such attitudes appeared in a newspaper that purports to be 'the national newspaper for Wales'." At the time the article was published I was fairly scathing of the views that were expressed therein. However, I think that I would draw the line at seeking to censor the columnist concerned. The freedom of newspapers to publish controversial views should not be constrained by what politicians believe are the editor's responsibilities. That is a very dangerous path indeed. I can certainly share Gwenda Thomas' disappointment and her anger but ultimately it is for the editor to decide what goes into his newspaper and how he responds to the very valid criticisms that may follow. The Observer reports that when Ming Campbell stands up in front of Party Conference as leader for the first time in about an hour and a half from now, he will signal his determination to overhaul the party's economic and social policy and streamline its campaign machinery with the kind of US-style techniques imported by Labour and the Tories. No surprises there then. Rather predictably they also report that we are seeking to part-privatise the Post Office. I suggest that they go back and re-read the motion but then as they have already decided what our agenda is then no doubt this will make no difference. Still, it is nice to see my old friend and constituent, Peter Hain, wading in with claims that we are poised to do a deal with the Tories to oust Labour from Downing Street. As usual most of his claims are just absurd, whilst his analysis of the General Election result is psephologically suspect. As I have demonstrated in the past the idea that by draining off Labour voters at last year's election, we handed a number of seats to the Tories is sheer nonsense. As this Guardian article makes clear the actual impact of switching from Labour to the Liberal Democrats was to er.... elect more Liberal Democrats MPs. Still, if it keeps Peter Hain happy, who am I to quibble? One of the hazards of Conference is the ability of so-called senior MPs to monopolise the agenda with their own policy announcements. Even though the particular proposals they are talking about are not up for discussion and will not be voted on by representatives, suitable pre-briefings and a properly timed speech on something especially controversial can give the ordinary public the impression that the whole Conference has agreed with the MP in question. We have just voted to reject a constitutional amendment that would have meant that all policy will lapse afer eight years. Those behind this amendment were worried that our opponents might pull out a paragraph from some old policy paper and use it to attack us. What they should be more concerned about is what our enemies will do with the words of MPs who do not seem to understand that it is Conference that makes policy not them and that if they want to get a proposal through then they should do so in the proper deliberative manner. This morning's speech by David Laws is a good case in point. He stood before the Conference and told us of his plan to cut up to £2 billion off the benefits bill for lone parents. This is not party policy, it has not been approved by Policy Committee or the Conference representatives, but the media are now quoting it as part of a so-called rightwards drift in the Liberal Democrats. I could speculate that David Laws chose the route he did because he knew that he would never get this policy through Conference. We will see. However, one thing is clear, somebody needs to give all of the MPs a good talking to on their role in the policy making process in the party. In doing so they might want to use the excellent example set by Norman Lamb, who took his Post Office motion to Conference, accepted the reference back gracefully, consulted, amended his proposals and then brought them back to Conference again. In doing so Norman earned respect and credibility in the party that will hold him in good stead in the future. David Laws will do well to learn from that. This party does not like being hijacked. As somebody said today, many people go into politics because they have strong religious views and a sense of duty to their country, but once they are in power they are required to act in the best interests of those who elected them. Their own faith should not form part of any decision-making process and it certainly should not be used as a prop to avoid proper scrutiny. Greetings from snow-covered Harrogate where the party has just debated and approved a policy to invest £2 billion in the sub-Post Office network. They will do this by separating Post Office Limited from the Royal Mail Group and retaining Post Office Limited in the public sector, giving post offices the opportunity to develop new business. We are proposing a shared ownership model for Royal Mail with a 51% majority of shares divided equally between the government and a Trust for Royal Mail staff, with half of the remaining 49% of shares sold directly to staff and small investors and the remaining shares being offered for sale to the market. We will guarantee the Universal Service Obligation as a vital public service and effectively allow employees a real stake in the success of the company. No doubt many will portray this as privatisation but nothing could be further from the truth. It is retaining vital services in the public sector, attracting much needed private investment to bolster a important social business network and guaranteeing a better service to all customers. This is about finding a way forward that will avoid and oppose the Labour Government's plans to close 10,000 Post Offices but will enable us to propose a real and positive alternative. Having survived my reselection and once more emerged as top of the South Wales West list, I am very aware that the run up to the 2007 Assembly elections has started. Judging by this article Labour are planning ahead, but they are using public money to do so. Whether in the normal course of events the Welsh Assembly Government can justify employing six "Heads of Ministerial Communications Teams", each on a salary scale from £37,918 to £48,990 is debatable. To do so in the face of acute service pressures in local government, education, and the NHS and an abandoned manifesto commitment for free personal care for the disabled is just crass. When they start to recruit these posts a year before the election I think people are justified in being cynical and asking whether there is a connection. In the interests of transparency and fair play the Government should abandon these plans for now, open them up to scrutiny and revisit them once the election is over, and then only if they can be justified. Well with one leadership contest over, we are now embarked on a second. However, as this is rugby it is far more serious. Bring back Mike Ruddock I say. The First Minister (Rhodri Morgan): Your Majesty, Your Royal Highnesses, honourable guests, Presiding Officer and fellow Members, a good St David’s Day to you all. However, is it actually St David’s Day? At a church service last Sunday, I was staggered to find out that this year St David’s Day has been moved from 1 March back one day to 28 February. This is because Ash Wednesday is on 1 March this year and it takes precedence over any saint’s day, even the day of St David. So, we are all 24 hours late. I have been accused in the past of being late for some royal gatherings, but if I am 24 hours late, we are all 24 hours late. That is only under canon law—another area of legislation not devolved to the Assembly. We can say that this 1 March is a very special St David’s Day indeed because of your presence at this very special occasion to celebrate the official opening of the new home for the National Assembly for Wales—the crucible of our still young democracy. On a previous royal visit to the Assembly one somewhat cynical metropolitan parliamentary correspondent referred to the old chamber next door as resembling the passenger lounge in an ageing cross-channel ferry. This new chamber, with its computers, has been compared to the control room of the starship Enterprise, so that is progress for you—boldly going into the future which, on this occasion, managed to arrive both on budget and on time. The successful completion of this building is part of a growing confidence in Wales that we can get things done. If we can build buildings to be proud of to a budget, we can assuredly take decisions that affect our future. Wales can run things and do things. It is part of our maturing as a nation. The Government of Wales Bill, which received its Third Reading in the House of Commons last night, is likewise part of that maturing of our democracy. The Labour members preferred to think that the reference to guys in sandals was about the Liberal Democrats, though the only person who does wear sandals in the chamber is the Deputy Presiding Officer. However, I don't think they should take it too literally, after all it is Labour AMs who sit behind the First Minister and once the 2007 elections are over, it will be open season to succeed him. Even by Welsh standards, having three St. David's Days seems a bit excessive. Does that mean that we are campaigning for three consecutive bank holidays whenever Ash Wednesday falls on 1 March? It has been understandably a bit busy here for the last few days so I am still catching up on my internet browsing. It is a shame therefore that I did not spot this piece in the Guardian earlier about the use of the internet by the Liberal Democrat leadership candidates. With the result due later today it is all a bit academic, but nevertheless it does point the way towards the future in campaigning terms. Whether podcasts and on-line videos will ever replace leaflets and canvassing is another matter, but they may well prove to be a useful supplement. Just as long as we can get past the Beavis and Butthead talking-heads syndrome so comically evident on Mark Oaten's pioneering first attempt. The prospect of today's official opening obviously went to a few people's head during Tuesday's Plenary meeting. Not only was there some smugness in the questioning but also some interesting information . opportunities presented by that unique cultural inheritance? is more a matter for the tourist department. The Deputy Presiding Officer (John Marek): Visitors to the Senedd are welcome. were 16,773 visitors to the Senedd. esteem and dignity, which the word ‘chamber’ did not provide? that word, I do not think that it would be a great feat of translation to say ‘senate’. However, if people can say ‘senedd’, we would like them to do so. By my estimate that is over 1,000 visitors a day, a very impressive feat proving that the building has certainly stirred people's iumagination. The sun rises over the Senedd. OK this photo was not taken today when the Queen is due to officially open it as there is no snow in it but you get the idea. I was at a St. David's Day dinner in the Millennium Stadium last night hosted by the First Minister. It was packed with foreign dignitaries. Rhodri Morgan started off the ceremonies with a fairly witty speech, including a tribute to the new building. Rhodri singled out Lord Richard Rogers for particular praise and said that the Senedd could not have had a better architect. He then went on to refer to the Prince of Wales' notorious dislike of modern architecture and suggested that Charles might not appreciate the fact that the building had been built by Richard Rogers. He might have been happier, he said, if it had been designed by Roy Rogers, or even Trigger.